The Digital Advocates Network was created in the spring of 2018, to better support bottom-up initiatives to enhance teaching, learning and assessment across the collegiate University. To create a support network and to propagate innovation and good practice. Events are held once per term and networking and information-sharing opportunities will be provided at each event. If you are interested, please join the Digital Advocates Mailing List (members of the University only; Raven-protected). 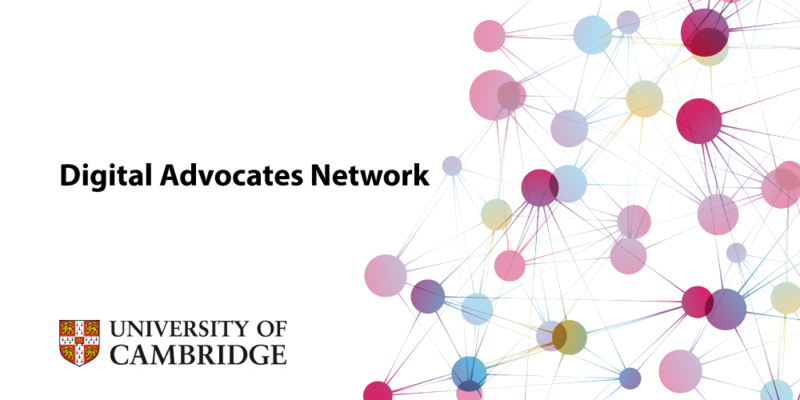 The next Digital Advocates Network event will be held on Friday, 17 May 2019 in the afternoon. This event will focus on the flipped classroom model and its applicability to the teaching environment at Cambridge; it will involve material to be reviewed/prepared prior to the event, and hands-on small group activities on the day. The event is open to any University of Cambridge staff member. Register for the next DAN event. Details and full programmes can be found on the Previous Events page. For further information about the Digital Advocates Network, please contact Melissa Rielly.